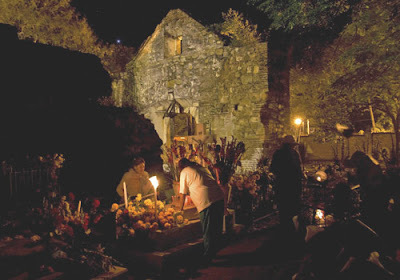 Dia de los Muertos ... Mexicans light candles and hold ceremonies at the graves of relatives to celebrate the Day of the Dead holiday, in connection with the Catholic church's All Saints' Day and All Souls' Day. 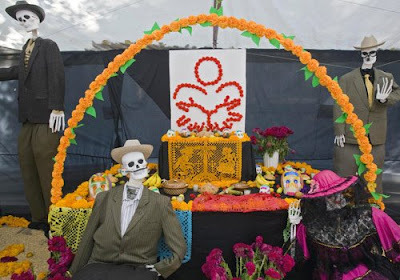 Festival traditions include building altars honoring their deceased family members, using sugar skulls and the favourite foods and beverages of the departed. Costume party ... locals also dress as the dead during the two-day festival. 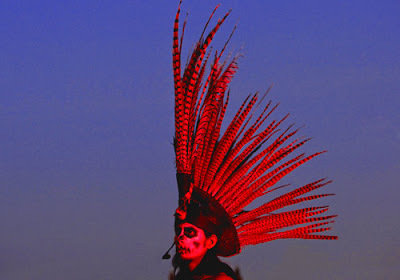 Spooky ... Mexican natives dress as pre-hispanic Aztecs during ceremonies throughout the Day of the Dead. 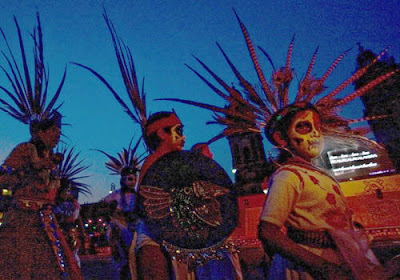 The tradition combines native Aztec and Roman Catholic practices and beliefs. 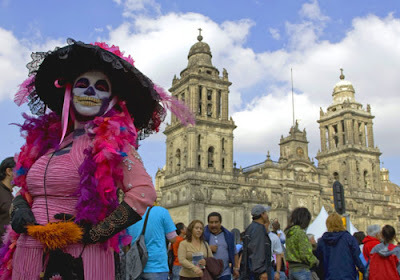 Once upon a time in Mexico ... women dressed in Aztec costumes perform the Dance of the Dead in Mexico City's Zocalo Square. 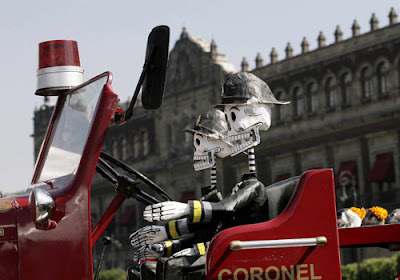 Keeping tradition alive ... an art installation of skeletons and skulls is displayed in a theatre where artists assembled an altar for the dead in Mexico City's Zocalo main square. 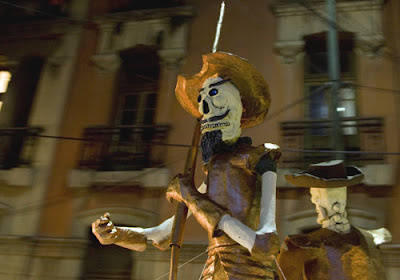 Ghosts in the night ... a ghostly figure of Don Quijote floats through Glorietade los Insurgentes, in Mexico City. 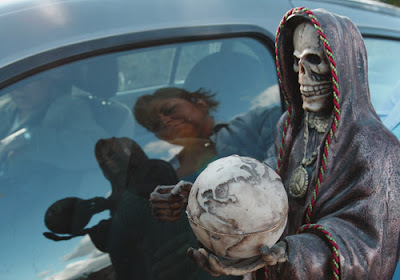 Somber gaze ... a woman carries a figure of La Santa Muerte, or 'Death Saint', as she arrives to attend a mass during Day of the Dead celebrations. 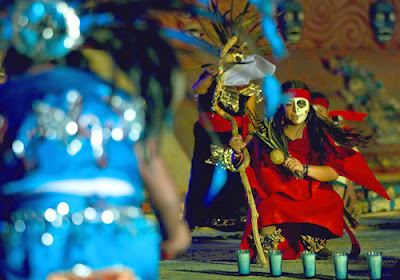 Warrior ... music and creative costumes dominate the country as dancers take part in the Dance of the Dead. Doom and gloom ... the celebrational dance goes on long into the night. 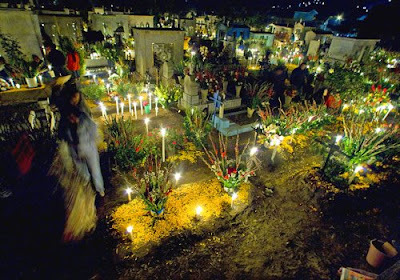 Everything is illuminated ... a Mexican family gathers around the grave of a relative during the Day of the Dead celebrations at Xoxocotlan cemetery in the Mexican state of Oaxaca. 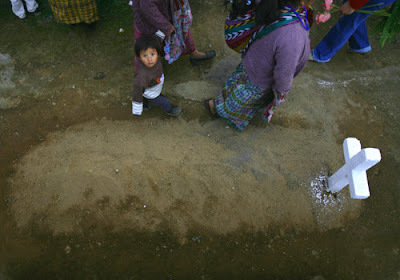 Grave walkers ... villagers walk in a cemetery in Guatemala to honour the dearly departed. Paying homage ... an altar decorated with an arch of Cempasuchil flowers is prepared for the Day of the Dead. 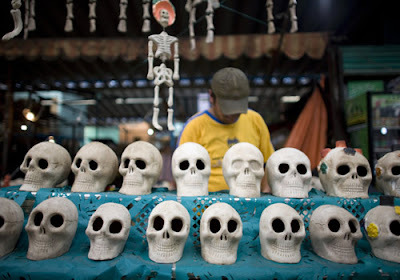 Skulls for sale ... decorative skulls sit for sale in Mexico City's largest flower market, Mercado de Jamaica.